It’s a brave thing to make a film these days that isn’t wall to wall with action, snappy dialogue, or a traditional progression of plot – to instead make a film that explores stillness and the tension that lies beneath. 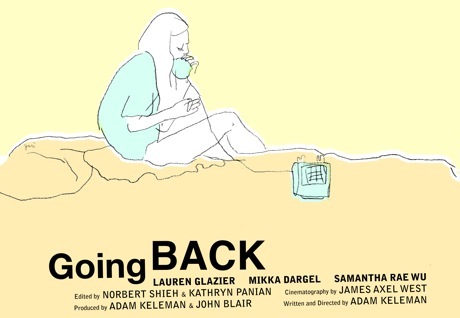 Our friend Adam Keleman’s short Going Back, which premiered at the 2010 SXSW Film Festival, demonstrates such bravery. The film follows Lorna, a failed model who has recently returned to her hometown somewhere on the Pacific – a place where the main attraction is a roadside diner that’s patronized by the “usuals”. Lorna will now presumably pass most of her days to come at the counter with a cup of coffee and the circulars, looking for a “real” job. Yet, the film only shows us a snapshot, a small window into this particular time in Lorna’s life. It’s almost a moving photograph in its stillness and concision. Because Adam’s camera is truly so still, the film is as much about location as it is about Lorna – just how does Lorna interact with this familiar, but renewed environment? In this way, the film is a double portrait, a diptych of person and place. For me, the film is pure transportation: a look at a recognizable but distant world, a world to which we have access thanks to the small peephole through which Adam has pointed his lens. This entry was posted in Film, Shorts and tagged 100 Down, 100Down, Adam Keleman, Going Back, One Hundred Down, OneHundredDown, SXSW. Bookmark the permalink.